Beverly Hills, California — February 20, 2012 … Julien's Auctions, the world's premier entertainment and celebrity auction house, announced an auction of epic Hollywood proportions featuring legendary costumes, memorabilia, props and celebrity figures from historical Hollywood museum in Belgium. The prized Hollywood Museum collection features an exclusive selection of memorabilia and effects from some of Hollywood's most legendary stars. From the Golden Age of Hollywood to Superman, Julien's Auctions Hollywood Legends sale covers a remarkable history of film and television along with personal stories of the world's most loved stars. Highlights include a Charlie Chaplin iconic cane (Est. 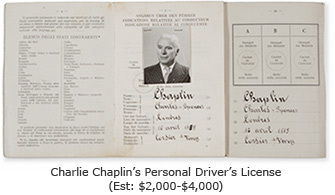 $20,000-$30,000), Charlie Chaplin film worn suit (Est. $20,000-$30,000) and a number of his own personal items including his personal drivers license (Est. $2,000-$4,000). Other highlights include Clark Gable's riding jacket from "Gone With The Wind" (Est. $10,000-$15,000), a Charlton Heston screen worn robe (Est. $30,000-$50,000) and screen worn staff (Est. $20,000-$30,000), screen used tablets from "The Ten Commandments" (Est.$20,000-$30,000), Marilyn Monroe pantaloons worn in “River of No Return (Est. $20,000-$30,000) and a vintage Christian Dior gown worn by Princess Diana (Est: $10,000–$20,000). The museum collection includes other notable items which are in the sale featuring a Princess Diana dress designed by Catherine Walker (Est. $60,000-$80,000), a signed catalog from Princess Diana sale (Est. 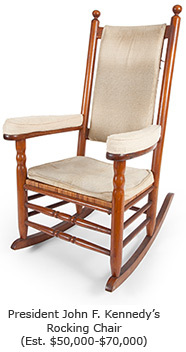 $4,000-$6,000), President John F. Kennedy’s Rocking Chair (Est. $50,000-$70,000), Margaret O’Brien’s red coat from “Meet Me In St. Louis” (Est. $2,000-$3,000) and Richard Gere’s hat from “An Officer and a Gentleman” (Est. $2,000-$4,000). As part of the museum’s massive Hollywood posters collection, Julien’s Auctions will also offer a selection to include original posters from legendary films like “Casablanca” (Est. $2,000-$3,000), “Gone With the Wind” (Est. $1,000-$2,000), “Some Like it Hot” (Est. $2,000-$3,000) and many more. From the early start of films to today’s action heroes, Julien’s Auctions Hollywood Legends Sale will offer the savvy collector and museum an array of one-of-a-kind pieces of memorabilia to own and cherish that even includes superheroes and men who have gone beyond the walls of space. The Superhero memorabilia includes a Christopher Reeve Superman costume from “Superman IV: The Quest for Peace” (Est. $20,000-$30,000), a complete Batman costume on a custom display from “Batman Returns” (Est. $60,000-$80,000) and a Turbo Man costume from the Arnold Schwarzenegger holiday film “Jingle All The Way” (Est. $2,000-$4,000). The auction will also feature items from the Estate of Rue McClanahan, including television memorabilia and personal belongings spanning her career, most notably her nightgowns from The Golden Girls (Est. $400-$600). The Exhibition of Hollywood Legends presented by Julien’s Auctions, Beverly Hills is designed by Rush Jenkins and Klaus Baer, of WRJ Design Associates, who have designed exhibits for The Collection of Michael Jackson, The Estate of Johnny Cash, The Collection of Cher, The Collection of Barbra Streisand and more recently The Estate of Tony Curtis. Registration is required to bid in this live auction and can be done either in person at the exhibitions and auction or by visiting our Registration page at www.juliensauctions.com before the sale or by calling (310) 836-1818. Enter Absentee bids. Absentee bid forms are printed in the back of each catalog, and are also available by calling Julien's Auctions at (310) 836-1818 or online at our Register to Bid page. With expertise specializing in entertainment memorabilia, Julien’s Auctions has quickly established itself as the premier auction house in high profile celebrity and entertainment auctions. Julien’s Auctions presents exciting, professionally managed and extremely successful auctions with full color high quality auction catalogs unlike any other auction company. Previous auctions include the collections of Cher, U2, Barbra Streisand, the estate of Marilyn Monroe and many more. Official website is www.juliensauctions.com. For auction highlight photographs at 300 dpi (and above) or the auction catalog cover artwork, please email requests to: info@juliensauctions.com.